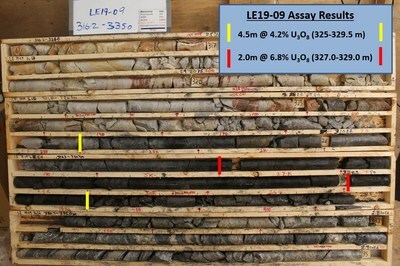 VANCOUVER, April 1, 2019 /CNW/ - IsoEnergy Ltd. ("IsoEnergy" or the "Company") (TSXV: ISO; OTCQX: ISENF) is pleased to announce assay result for drill holes LE19-09, LE19-10 and LE19-11. 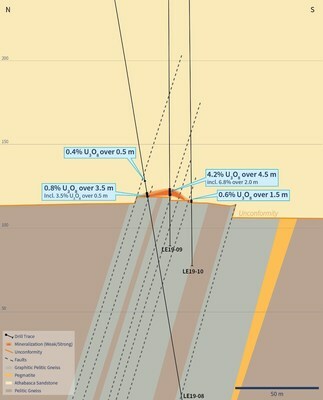 The highlight is drill hole LE19-09, which intersected 4.5m of 4.2% U3O8, including 2.0m of 6.8% U3O8. 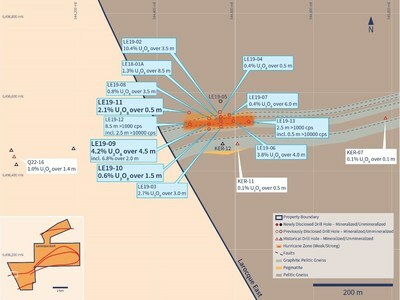 Drill hole LE19-09 was collared 30 metres to the west of drill hole LE18-01A, the original Hurricane zone discovery drill hole which returned 8.5 metres of 1.3% U3O8 including 2.5m of 3.6% U3O8. 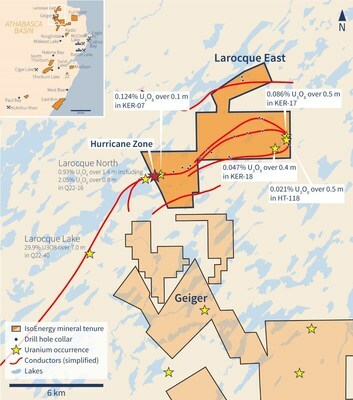 The Hurricane zone is a new discovery of high-grade uranium mineralization on the Company's 100% owned Larocque East property (the "Property") in the eastern Athabasca Basin of northern Saskatchewan (Figure 1). The Company recently completed the first follow-up drilling program since the discovery in 2018. With 11 of 12 drill holes in the follow-up campaign intersecting significant uranium mineralization, the program successfully expanded the mineralized zone to 150m (long) x 38m (wide) and up to 8.5m thick. Mineralization remains open on all five sections drilled to date, and along strike in both directions. The Company, having raised $5.5 million in December 2018, remains fully funded for a follow-up drilling campaign that is planned for the summer. Steve Blower, Vice President, Exploration commented: "Continuity of the uranium mineralization at the Hurricane zone, as exemplified by these drill results, continues to be encouraging. I'm particularly pleased with the robust intersection in drill hole LE19-09, and am impressed with the interval in LE19-11, given that we didn't expect mineralization to extend that far north. The result bodes well for further drilling on that section."